The term ‘compactness’ has been somewhat of a buzzword in football tactics over the past few seasons, particular in the last campaign where Simeone’s Atletico Madrid side won the league with a system so heavily oriented on the aspect. In this article, I will be looking to explore the benefits of this tactical attribute with some scenarios from past games, whilst showing the contrast between European forces and that of English teams. “What is defending? … Defending is a matter of – ‘How much space should I defend?’ … Everything is about meters, that’s all”. The standard definition of compactness is to maintain a short distance between the furthest players both horizontally and vertically, however such a basic response lacks in it’s application – to start with, what is the optimal level of compaction? For this reason I believe there must be other definitions which could provide a less simplistic answer, proving more applicable in practice? 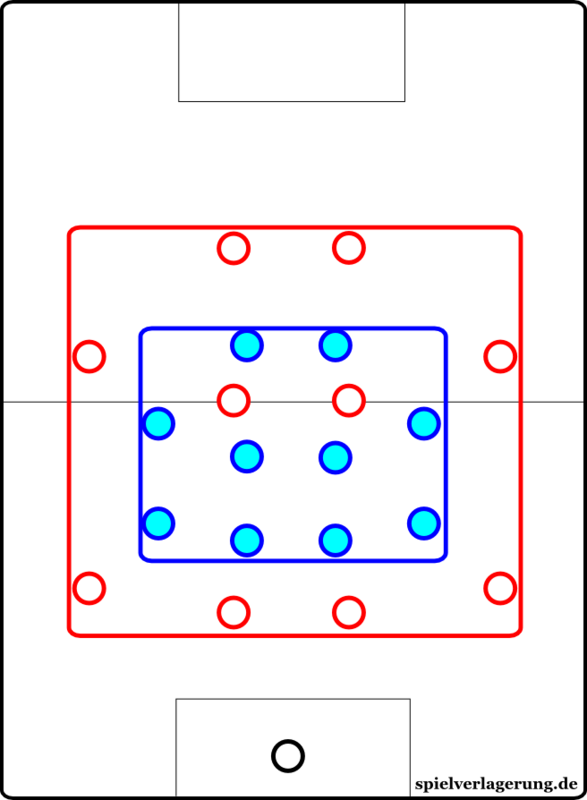 Basic definitions of compactness, the Red team have large distances on both a vertical and a horizontal axis, making them uncompact. Alternatively, it could be broken down to an individual level. 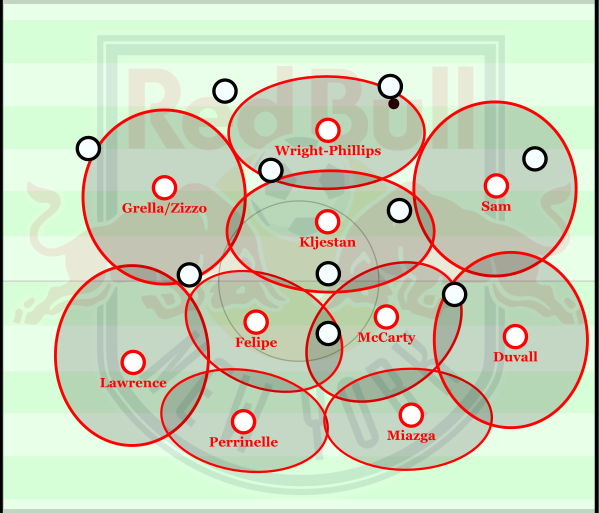 Possibly to the point at which the players are close enough together to be connected, ensuring a compactness within the shape – obviously a prime aspect. It could be reasoned that it is at this point where the benefits of compactness come into effect, making it a suitable definition and measurement of the term. However, all 10 players could be stood within a 5 yard perimeter, and they would be connected yet the defensive capabilities would be non-existent – so what is the optimal level? This can be somewhat dependent on the opposition, however a good starting point may be the instance that the individual players are as far away from each other as possible whilst maintaining the connections. Through this, they can control more space whilst retaining the benefits of a compact block. 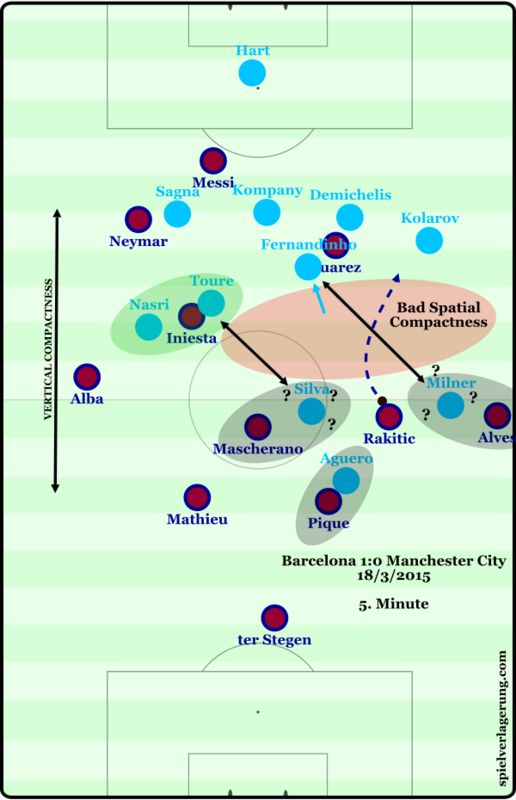 Another argument is that compactness needs to be relative to the positioning of the opposition. It is not only a matter of how compact a team is within itself but also that the distances between themselves and the opposition are short. Through this a key principle of compactness is achieved, the playing area of the opposition is minimized which wouldn’t be the case had only the initial definition been taken into account. 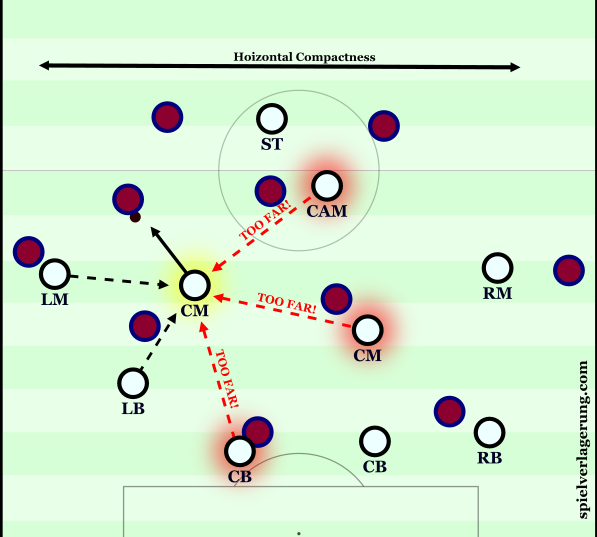 One of the plethora of defensive advantages gained from a high compactness is the increased number of connections between the individual defenders. A connection could be classified as when a player is within distance to be able to support a teammate, such as through a secondary press. Through this, a defensive block can be much more stable against the opposition’s attempts to penetrate as multiple (an optimal number is highly dependent on the specific scene) players can attack the same space simultaneously. The shorter distances between individual players makes penetrative passes more difficult as the passing lanes are minimized, whilst multiple players can challenge the same through ball if needed. In an uncompact shape such as here, only two players are in distance to support should the CM be challenged in some form by the ball-carrier, whilst the 3 other players are too far away to move and act in time. What is worse that in this case, where the players are slightly oriented to man-marking, two of the disconnected player are required to protect the centre from opening up. Given that they’re both disconnected from the yellow-highlighted player, the midfield’s structure is very weak and could quite simply be opened up. The improved connections in a compact defence can be crucial. In contrast, the player when accompanied by a team organisation of good compactness has 5 connections with other teammates; 3 of whom are from a central position, ensuring greater defensive stability in a key area of the pitch. Aside from this, the team also benefits from having two other players near the opposition ball-carrier, who can then support in the pressing. A compact defensive block can make use of a better defensive access to the ball. By this, I mean that the defending team have a better ability to effectively and correctly press the ball to challenge it in some form. A scene from a match involving AO’s UNG team (defending) against Georgia State University. Originally his team have poor access to the ball in their press. 1. The first overload in the ball-near space is created from the right centre-back pushing up as he is completely free, forming a 4v3 superiority down the flank (marked blue). This is primarily resulting from the lack of shifting by the team (especially in the two strikers), resulting in poor horizontal compactness. 2. Secondly, a 3v2 overload is created in the most crucial space – the centre of the midfield. With the right-midfielder marking the wing-back, the defending team are suffering the consequences of lacking horizontal compactness. The positioning of the right striker is also an issue as previously stated, whilst the lack of staggering makes the overload even more easily-exploitable for the attacking team. With a greater compactness, his team benefit from improved access to the ball. On a basic level, the simple factors of things such as having a strong ball-near compaction translates to a better access to the ball as more players will be in a position to press. Aspects such as a good ball-orientation and the preparation for pressing is also important to ensure than an effective pressure will be made on the ball. The impact of more players around the ball allows for the space around the ball, limiting options and restrict in the opportunity of evasion through dribbling. With bad access to the ball, mainly as a result of a poor compactness, the ball-carrier can create a 4v3 overload whilst has the time and space to penetrate the opposition – possibly through attacking the underloaded side through a switch. On the other hand, with a compact organisation the defending team profit from having good ball access, forcing the ball into a strategically weak area which can be pressed further with ease. When utilising a compact shape (especially when focused on horizontal compaction specifically), there is a necessity to maintain ball access at all times. Without ball pressure, the opposition will be able to exploit the underloaded side of the pitch by switching the play due to having lots of time without a challenge disrupting their ability to progress ball possession. In the above diagram, had there not been the very good ball access which is shown then the defence would be very unstable as the opposition could make a switch to exploit the underloaded opposite flank with a 2v0. A needle player is one who possesses an excellent close control and dribbling ability, which can be used to allow his team to maintain ball possession in a high position on the field, where it would be subject to above-average pressure from defenders. Because of this reason, they are especially effective against compact defences to the point of being considered on of the main ways to counteract a defence in this situation. Considering this, a compact defence can be used situationally to exploit a team who lack such players; an example being Real Madrid, when playing their capital rivals Atletico. Over the past season, there has been a distinct contrast in the performances of Real Madrid and Barcelona against Simeone’s team. A key reason for this is the particular qualities of the players which Ancelotti and Enrique have available. Barcelona are renowned for their technical excellence, with every player in the attack being able to maintain possession under considerable pressure. This helps them massively when they come to play teams such as Atletico, as they have multiple needle players who are tailored well to breaking down a compact defence. 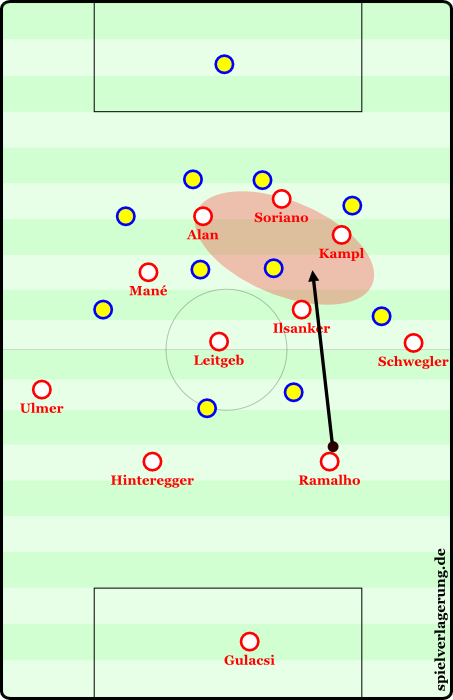 An image from the German domain, notice how Barcelona still position many players inside the Atletico defensive block, as they can still be effective in such tight space. On the other hand, players such as Ronaldo and Bale need space to be effective. If they aren’t provided with space to move into by the opposition, then they struggle massively which has shown as these players have failed to influence the game in recent fixtures. It’s not that Real Madrid don’t have the players necessary to be effective against Atletico, because they do – the likes of Modric and Isco could be vital in penetrating Simeone’s 4-4-2-0; however Ancelotti has misused such players at times and not used them to their full potential. A scene from the 4-0, players such as Bale are given no space to utilise by the 4-4-2-0. Real Madrid’s structure is much more wing-oriented when compared to the above image of Barcelona. In addition to this, Ronaldo’s inactivity in the development of possession in midfield forces Ancelotti to use Benzema in a role of dropping deep to support the likes of Modric and Kroos. This can disrupt the balance because Ronaldo creates little effectual presence as a lone striker (as he is a player of individuality) whilst means that the often underrated Benzema cannot be used to his fullest potential higher up the pitch. By having shorter distances between the furthest players both horizontally and vertically, a team will technically be covering less space, but they will be controlling much more. By having a compact shape, a team can enforce a much higher degree of control on an area of the pitch whereas if they were more spread out, then their spatial control will be far worse. Spatial control can be achieved through the numerical superiority within said space, which stops the opposition team from obtaining access and utilising the zone for any strategic benefit. The overload improves the cover of passing lanes, restricts any usable space and minimises the possibilities from inside the block itself in order to force the opposition into circulating possession into an alternative and usually less strategically valuable space. The management of spatial control is a key factor in a team properly utilising compactness against the ball. In most cases of defending, there are spaces on the pitch which are not necessary to cover for the opposition cannot utilise it to provide benefit, for what could be a number of reasons from lack of access to penetration from said area. Therefore the defending team can ‘cut the corners’ of the shape to ensure that the management is at its most effective, emphasising the key areas which need controlling whilst sacrificing the spaces less valuable to the opposition. A simple and common case of this, which rarely varies depending on the opposition, is the narrow positioning of the outside midfielders in Atletico’s 4-4-2-0. Instead of covering the wide spaces, they come inside to cover the half-spaces which are much more valuable to occupy. The defensive block is covering a large space with little control over it. Whereas here, they’re covering less space but exerting a large degree of control over it. Expanding on this, through maintaining a compact defensive block a team can focus on a specific space on the pitch. In most situations the optimal area to control is the centre as it holds greater strategical value for a number of reasons, such as a greater range of potential movements whilst it offers the best platform to access alternative spaces. Similarly to the sport of chess, the centre is largely considered as the most important part of the playing area. In the above scene from a Karpov – Kasparov match, Kasparov (black) develops central control which is crucial to his eventual victory. 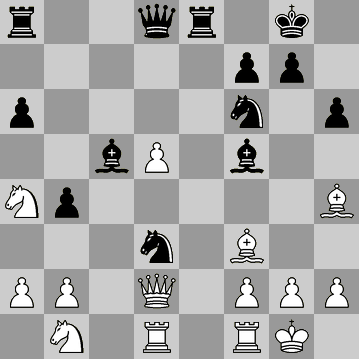 This is achieved through intelligent use of his anchored D3 knight (A.K.A the octopus, referencing its excellent control of key squares) and advances his B4 pawn, forcing the A4 knight for Karpov, he forces the opposition knights into passive squares from which they can enforce no control. Where Karpov only has a bishop and queen (though advancing the queen so early is very dangerous) which can influence the centre of the board, whereas Kasparov has both knights and both bishops in strong positions. Furthermore, this principle can then be adapted to specific opposition. 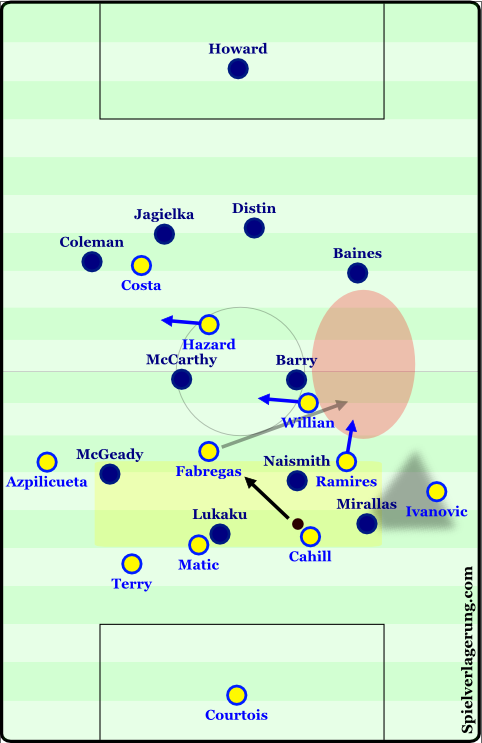 In many cases, teams will have at least somewhat of an emphasis on a particular area of the pitch in attack – to counteract this, the defending team can maintain an especially compact defence in this area, negating the impact of their strategy whilst potentially forcing a redirection of the attack. An example of this is commonly done by Real Madrid in their Clasico matches against Messi. Defending in their 4-3-3-turned-4-4-2, they often have a greater compaction on Barcelona’s right side where Messi is positioned. From this they obviously look to minimise his influence and dribbling ability inside. Madrid defending on Messi’s flank. Through control of the centre of the pitch, a compact defence can force the opposition into one of the most inefficient attacking strategies – crossing. An analysis by Michael Caley (MC_of_A on twitter) found that headed shots and shots assisted from crosses have a conversion rate much lower than normal shots from the same position (you can find the relevant analysis here). It is a common sight than when the central passing lanes are covered with little usable space within the defensive block, the attacking team will resort to passing to the only free advanced player – the full-back. In a lot of these situations the full-back will then cross from a deep position – the most inefficient position to cross from. This has been the case in a few matches recently, perhaps most notably in Gladbach’s 2-0 victory over Bayern, and Juventus defeat of Dortmund in the Champions League. 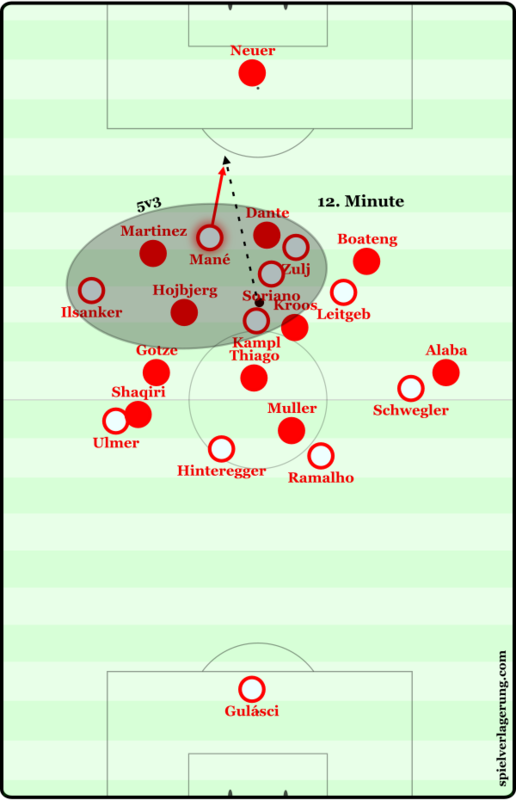 In both games the teams utilised a defensive block with emphasis on central control, which forced the opposition into attacking the wings which often resulted in tame crosses into the box. Following Juventus’ win, Stefan Lichtsteiner stated in the post-match interview that they simply looked to defend the centre, with BVB’s crosses causing little threat. This strategy was particularly useful against Dortmund because Aubameyang offers little aerial ability whilst he possesses much more threat on cut-backs and central attacks. In addition, the somewhat of a surprise selection of Sokratis at right-back meant that the possession game down the right of the pitch was lacking in several aspects as he rarely got into advanced positions and didn’t support Mkhitaryan in the development of possession with potential combinations. The issue with crossing is the almost-necessity for a first-time shot, topped with the difficult angle and pace at which the ball is being delivered into the player. Aside from that, the ExpG (expected goals) of headers are much lower than standard shots, as are cross-assisted shots in comparison to a normal one. Through a compact organisation, a team can reduce the impact of individual weaknesses.This is due to a number of the above factors, namely the increased defensive connections. Simply given the increased support from teammates, a player who would be a defensive liability and weakness in a standard organisation is covered better, reducing the possibility of him being exposed. Another factor in this is the distribution of space between players. When a team lacks compaction, and the shape spans quite a large area of the pitch, each player individually has to cover a large amount of space also, which is obviously difficult unless your name happens to be Sergio Busquets. From this, the weakest players can be exposed and isolated more easily by attacking the big space which they’re responsible of defending. Expanding on this, since a stretched defensive block is more difficult to organise and maintain stability in, the distribution of space is often less even as some players end up covering more or less than others. By intelligent circulation of the ball, the attacking team could hypothetically manipulate this into creating an imbalance to their benefit, by forcing the weaker players to cover a larger amount of space. Two diagrams from an analysis of mine which will shortly be published by New York Red Bulls, displaying the spatial distribution in an uncompact shape. In contrast, an individual in a compact defence is required to cover a lesser amount of space, since the shape stretches across a lesser amount overall, making his defensive role significantly easier. As well as that, the distribution of space-coverage across the team can be maintained more evenly, making it more difficult for the opposition to exploit an individual weakness. 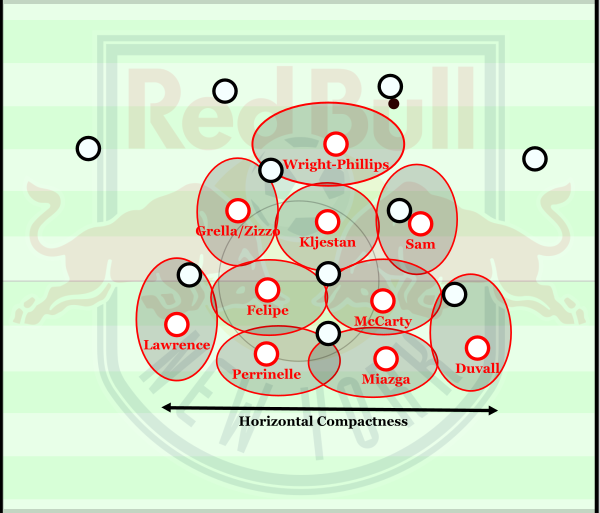 Whilst in this diagram, it shows NYRB’s usual compact shape under Marsch this season, with a better distribution of space, which is less for the individual also. A compact defence can also have benefits during the start of attacking transition, once possession has been regained. The increased numbers around the ball provides vital insurance against counterpressing, which could potentially be used by the opposition to immediately initiate another attack. A key aspect of the effectiveness of counterpressing is the premise that there are large numbers of players still forward following the attack, who can all begin to press after losing possession. Therefore, if the defensive team also has a large number of players around the ball during these moments then it works against one of the key features of counterpressing. Aside from this, the defender who regains possession instantly has a large number of passing options due to the amount of players nearby so he can quickly move the ball onwards away from the space where the opposition are closing in. The best and most extreme pressing teams in the world are all founded upon a well-organized and compact defensive block. With an increase in supporting teammates, the main pressing movements can be accompanied by auxiliary pressing from deeper players, creating a better-structured press which can attack the space more effectively. The addition of supporting movements is key to the stability of a pressing which otherwise could be easily countered into the space left exposed. A prime example of bad pressing was from an early Premier League (obviously) match between Chelsea and Everton. The diagram below shows how Everton’s very uncompact and uncoordinated press was easily exposed by Chelsea in the build-up to their second goal. Everton have particularly awful vertical compactness in the build-up, meaning Chelsea could easily exploit the spaces between the lines in the centre. There is often less of a requirement for an individual player to make long runs during pressing also. A common sight in the Premier League, is to see a lone striker run continuously for upwards of 5 seconds in an individual press, and is then easily beaten through simple passing. Not only can the player not maintain pace as he runs too far, but the simple fact that the ball can be moved quicker than a player can run over such a distance means that the pressing can very easily be bypassed. Uncompact pressing has greater demands on and individual and is rarely effective. On the other hand, when an individual is accompanied by other teammates, he doesn’t have to run as far as the space he needs to cover is less, and an alternative player will press once the ball nears his area. With multiple players pressing (or at least supporting) in the first line, the defending team can also adjust to a frequent changing of the ball’s position. Whilst a compact defence can press with greater numbers, reducing the demands in both distance and intensity of the individual. Pressing is less easily exploited when the block has a high level of compaction. During many cases of pressing with no regard to maintain vertical compaction, lines often open up between the lines, especially should the pressing be poorly-coordinated initially. A compact defensive block also minimizes the accessibility of passing lanes, which can be vital in the effectiveness of a team’s pressing. Without the possibility of utilising a vertical pass to bypass the initial lines of pressure, a player may resort to a lateral or pass backwards which would likely invite more pressure. The preparation in anticipation of pressing the opposition is also aided by a compact organisation beforehand. Within this, a team will make more fine movements in order to prepare the organisation to be in an optimal position to press from, ensuring that it is of high stability and co-ordination. This is supported by the compact shape as previously stated, the narrow block can be organised better and within a shorter time period as it is naturally stable due to the control and defensive connections. It is possible to translate some of the above principles into increasing the effectiveness of attacking. In some aspects, this is not as literal as in defence given that width can often be vital in supporting central possession, as shown by the positional play of Guardiola’s Barcelona and Bayern. Just like in the defensive aspects, an increased number of connections can benefit an attacking team. 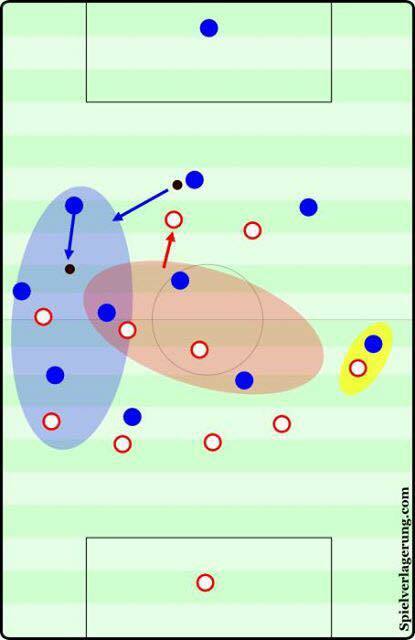 This facilitates the use of combination plays with more teammates in a distance from which they can support the ball-carrier. A prime example being Guardiola’s 3-3-4 seen through his final year at Barcelona. Such combinations can be used for many reasons from ball retention to creating a situation for penetrating the defensive block. A scene from Barcelona’s 8-0 demolition of Osasuna. The central movements of the players allowed for a combination to destabilize the opposition. With a greater density of players in a small area, overloads happen naturally as a result. These are vital in numerous ways, as they can allow the team to expose the opposite space on the field as the opposition try to match the numerical superiority whilst the simple number of players within a short space can cause great problems. Through the overloads, a team will always have a free player (trusting that the positioning isn’t so bad) which can be pivotal in the breaking down of a defence. In the situations of numerical superiority (a 3v2 for example), the attacking team must utilise the free player as there is no available defensive player to cover him. An example of this can be found in Roger Schmidt’s Red Bull Salzburg in their 3-0 defeat of Bayern Munich back in January 2014. The 5v3 overload for Sadio Mané’s opener. Inside movements from both Mané and Kampl help form a 5v3 overload alongside the less common higher positioning from Ilsanker, which came from the previous phase. The counterpressing following loss of possession is made much easier when the team are attacking with a more compact shape. This is quite simply a result of having a large number of players around the ball at the time of losing it, all of whom will be able to press instantly upon losing the ball. From a defensive perspective, counterpressing can be pivotal in the nullification of potential counter-attacks from the opposition. With the instant press of the attackers, the initiating pass can be cut off, stopping the break from happening at it’s beginning. 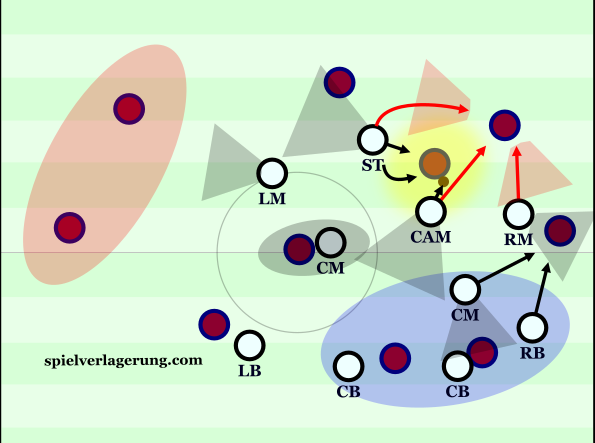 It can even be extended to be an attacking strategy, and has been used by Schmidt for both Salzburg and Leverkusen. In early possession, they will often make a vertical pass towards an area of high density upfield. The pass doesn’t have to be aimed at a teammate, but just in the general area, so that if it gets intercepted the ball carrier will be faced with 3-4 players counterpressing immediately. From these situations then, the attackers can generate good momentum and combinations breaking out following the compact counterpress. In their 7-1 demolition of Rome in the Stadio Olimpico, Pep Guardiola demonstrated an excellent method of counteracting a compact defence. On paper, his fielding of Arjen Robben as right wing-back in a 3-4-2-1 understandably came to some shock for a number of fans, as is his nature, but the Dutch winger produced a magnificent performance and was pivotal in their emphatic victory. Starting formations from Bayern’s UCL game versus Roma. 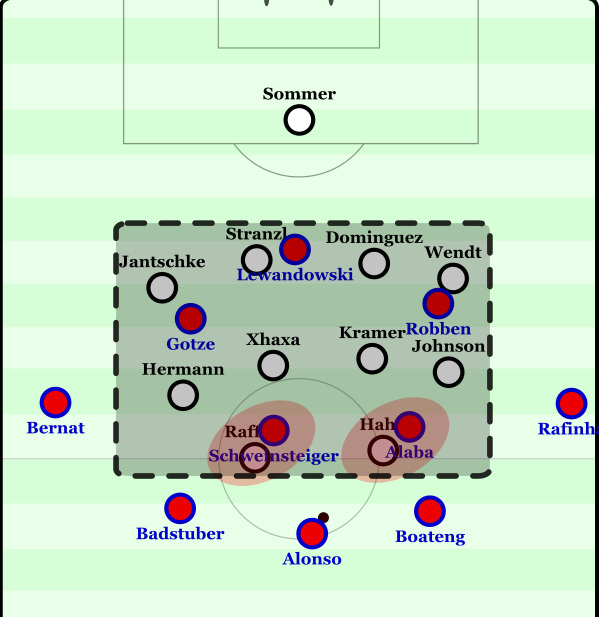 Through Robben’s very wide positioning, Bayern exploited Roma’s shape brilliantly which caused them great issues as they looked to maintain a good horizontal compactness. Simply through the wide positioning, Robben caused a massive threat whenever Roma were organised narrowly as through switching the play they could create 1v1 situations against Ashley Cole. This is emphasised in the fact that this was often through Xabi Alonso who is very effective in this area of his game. In argument of this strategy, one could state that such long diagonal passes are largely ineffective. Colm McMullan’s OPTA presentation on the matter, titled ‘Please stop applauding diagonal cross-field passes’, proves that this type of pass in particular is a very ineffective means of ball circulation in attack. From his study, McMullan found that for a start, this type of pass had only a 40% success rate across the top 5 European leagues. Expanding on this through analysing the events following a completed pass, he calculated the probability of a positive outcome (shot, final third pass and successful take-on are examples of these) of an attempted cross-field diagonal was a meager 17%. Furthermore, McMullan then used an alternate method of measuring the outcome by tracking the phases of play following the long diagonal (for example, 1 pass equals a phase, as does a shot, aerial duel or other events). This then found figures even more incriminating of the pass, showing that by the end of the possession phase, the outcome was positive only 15% of the time. Such findings carried significant proof of his initial hypothesis, which stated “Diagonal cross-field passes often have excellent aesthetic qualities, but my intuition is that they rarely directly lead to an effective attack”. On a side note, the study was particularly damning of English ‘hero’ Steven Gerrard who, although McMullan used the findings in favour of the Liverpool midfielder, made a significantly greater number of passes than any other midfielder and thus had a greater negative impact on his team – highlighting his lack of intelligence in passing. Going back to early-winter Rome, Xabi Alonso can be considered somewhat of an exception to the rule. Unlike his former Liverpool teammate, Alonso’s diagonal switches of play are often made with great pace and low to the ground which negates two of the key issues with such passes. Usually when a player will make this type of pass, there is often a lack of pace and it travels high in the air. In relation to the issue of the speed of the pass, when it is made with low intensity the opposition have much more time to adjust, prepare well for the situation and often challenge the ball upon the attacker receiving it. As for the trajectory, the fact that it travels high not only makes it difficult to control (especially when he is being challenged) due to the angle at which the ball is received, but it is almost impossible for the first touch to continue the attack – it often momentarily slows the play. With Alonso’s faster and flatter passing however, the team can rarely shift in time to be organised at the point of the attacker receiving the ball, whilst the flat passes don’t slow the play down since the first touch can often be forward, maintaining the pace of the attack. This equates into frequent 1v1 situations being made and given the quality of players which Bayern possess in this aspect, their attacking ability is far better than most – certainly not least in this situation as Robben made one of his best performances this season. A scene just following the 1st goal – where Robben had cut inside, beaten Ashley Cole and made an excellent curling shot into the far corner. The quartet do well to move the ball deeper to Alonso, who is in a position where Roma cannot press him instantly due to poor access. Then, as a result of the aforementioned characteristics of Alonso’s passing, he is able to find Robben with a brilliant switching pass which creates a 1v1 situation against Ashley Cole whom he beats before setting up Lahm for a cross towards the penalty spot. This factor alone was the source of a significant issue which Rudi Garcia was faced with. If he organised his team with an emphasis on horizontal compaction, then they would get exposed by Robben in the switching of play as demonstrated above. It only becomes a significant issue for Roma however, if you consider the consequences of not maintaining a compact defence against Bayern. 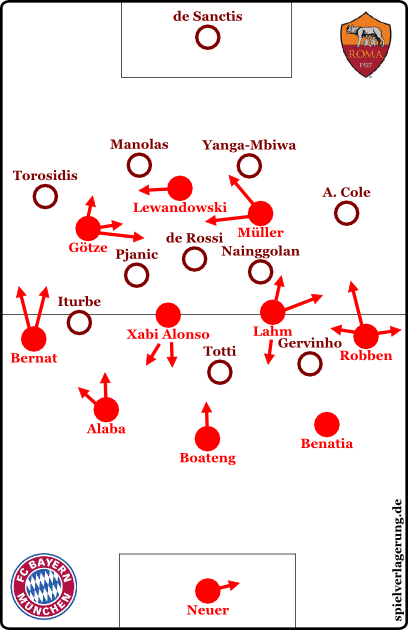 Had Garcia allowed his team to become stretched then the attacking talents of Gotze, Lewandowski and co. would’ve exploited the centre instantly, making it somewhat of a lose-lose situation for the Giallorossi. In hindsight, if Roma had made an emphasis on maintaining access to Alonso as frequently as possible, they may have found fewer issues as Bayern’s ability to switch would’ve been limited – something which teams have been doing more and more frequently in the Rückrunde. Admittedly, it is rather easy to suggest ways in which the defense could’ve been better organised following the original strategy resulting in a 7-1 dismantling. Another way of exploiting compactness is through a previously-mentioned aspect; ball access. During moments where the defending team is unable to press effectively, they become immediately susceptible in areas weakened by their compactness – usually the flanks or behind the defensive line. When against such a team, it is therefore imperative to exploit these situations when they arise – which is inevitable as very few teams can go a full 90 minutes with constant ball access in defence. Andre Villas-Boas’ teams are notorious for having this issue, as his Chelsea and Spurs sides both had issues with playing a high block without pressure on the ball, and he has brought the problem to Russia too. This is typified in a scene from Zenit’s 2-2 draw with Sevilla in the Europa League which sent the Russians out as Emery’s side edged the first leg 2:1. In their Europa League game against Sevilla, Zenit press with poor organisation and lack ball access as a result. In this case, Vitolo has managed to find lots of time and space on the ball as a result of Zenit having no access. You can contribute this to a number of different reasons, namely that the defending team had a very poor spatial compactness as demonstrated by the yellow highlight. The diagonal compactness, or spatial distribution is also quite poor particularly in the pair of Witsel and Shatov who show poor co-ordination and communication which ultimately leaves Vitolo free. Because it wouldn’t be an article about compactness if we didn’t have a laugh at the Premier League’s ‘attempts’. Whether it be a result of a poor-quality of coaching and management, or simply a factor of teams following suit after one-another in a mess of midfield-passivity and high blocks without ball access, the Premier League is notoriously bad in this tactical aspect. The best way to observe the stark contrast is when an English team takes to the European stage in search of Champions League glory (ha). A scene from Manchester City’s 1:0 defeat in Barcelona. In the above situation, Pellegrini’s side display a poor organisation in terms of compactness, which translates into an uncoordinated press. The vertical and horizontal compactness isn’t exactly good, but it’s not bad either – the issue is their spatial compactness. This is the level of compactness within the block and as shown by the red space here, they lack it severely in midfield. 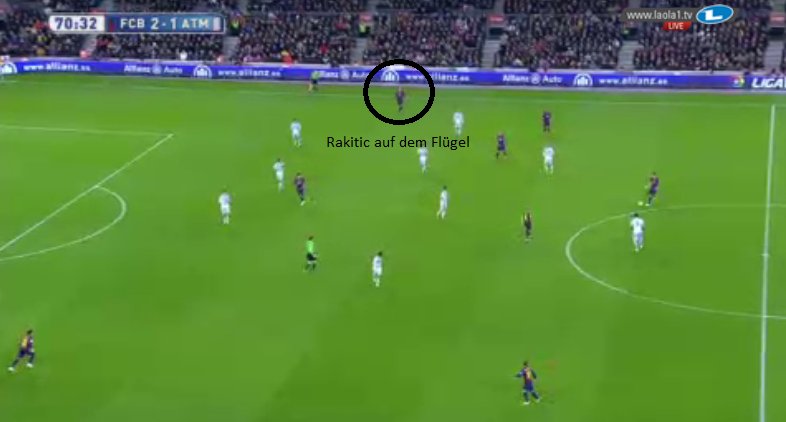 Once Rakitic breaks (can you break something which was never correct?) the line of Milner and Silva, he has a great area to drive into. The poor organisation overall in this scene can be contributed at least somewhat down to the lack of preparation. 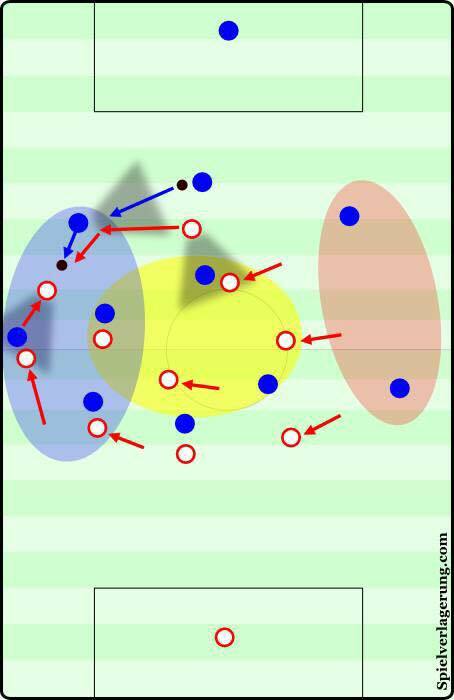 In the seconds before the diagram there was no effort to prepare the team to press by any player – the most severe case is perhaps amongst the deeper midfield 3 who have made no attempt to close out the space highlighted in red which would’ve made the press at least partially stable. These factors result in absolutely zero defensive access as Rakitic cannot be put under any decent pressure for a long period of time, at which point he could have already caused damage to the English defence. This, accompanied by spaces in the defensive block through poor spatial compaction, equates to a very threatening situation for City to deal with – one which results in an unmarked Neymar hitting the post from inside the box. Other aspects such as the incorrect situational man-marking highlight the poor intelligence which is common in English football, most likely a result of the coaching standard and culture. You can contrast this easily with teams such as Atletico Madrid, Bayern Munich and Juventus however instead of looking at the champions in their respective leagues (just like Man City), we’ll go to Monaco – a team Arsenal expected to walk over. 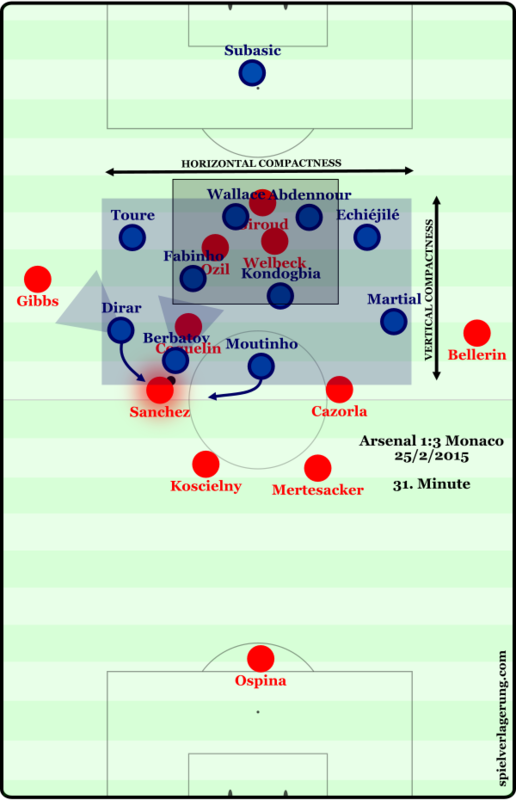 In contrast, Monaco held great compactness in their victory in London, stopping any chance of central access for Arsenal. In stark contrast to City, Monaco defend with a brilliantly organised compact shape. 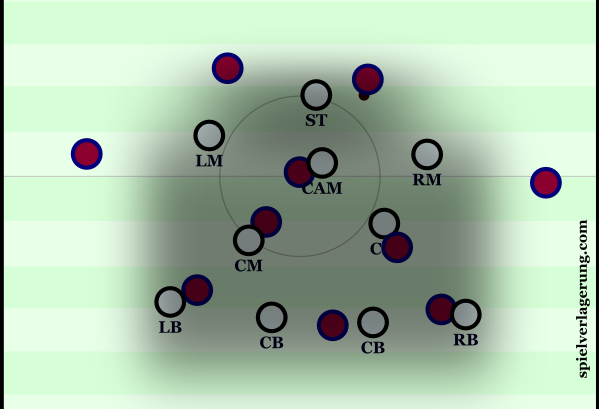 From this, they have benefits which City didn’t possess – such as strong defensive access to the ball (as they’re in a strong position to press with Berbatov suported by Mouthino and Dirar), whilst they control the centre and force the likes of Sanchez drop away from a dangerous area, as shown above. It is noteworthy that second before this diagram, the midfield and forwards made slight adjustments before pressing again, showing a preparation to increase effectiveness. When you talk about needle players, would it be accurate to consider Verrati one of them? It seems to me, that he has a huge role in PSG’s quest for european glory. Yeah, absolutely. Verratti definitely is the kind of player that is meant with the term “needle player” and I think there´s no doubt that he is a key player for PSG. This is an absolute forensic analysis. Despite it’s length, I found it fascinating, aided by great diagrams. The feeling that I get when watching the most popular football analysis shows in England and Portugal, as well as listening to their “top experts”, is that the vast majority of them seem like they haven’t got a clue as to what they’re talking about. They just spout the same things over and over and usually take the most simplistic approach. Whether this happens because they truly don’t have the necessary understanding of the game or because they are told by their bosses to dumb it down and keep it simple, we’ll never know. Gary Neville is the obvious exception but even he avoids talking purely about tactics and tends to focus on highlights or individual performances. And by the way, I can’t imagine talk of compactness will be understood (or even welcomed) at a local pub. I thoroughly enjoyed this article, you successfully articulated a number of important aspects of ‘making the pitch small’ out of possession which I really appreciated. I coach at junior level and I am contemplating taking my UEFA B licence. One aspect of the game at all levels I find frustrating and am trying to weed out of my team is that when we lose the ball players tend to behave as if the they are the last covering defender, even though we are in good shape and are trying to squeeze the play, and therefore they stand off and allow the attacker time on the ball. I think this is down to a couple of factors at the lower level of the game i.e. poor coaching at youth level and a lack of fitness. Keep up the good work, thanks. Fantastic post mate. I particularly liked the advantages compactness can have in attack really intriguing as that is not mentioned at all by majority of the pundits. RE: Chelsea, I think they still have issues (shown in the Everton and Spurs matches for example) but are capable of performing relatively well and better than most in the PL. Chelsea suffer from a slightly different problem when defending I believe. They are vertically compact most of the time and each player works hard to cover for a teammate or follow his marker, but they are not very compact horizontally. I think that’s mostly due to Oscar/Fabregas switching off and leaving Matic alone to cover a big area or William/hazard working almost as fullbacks at times, creating a 6-chain which leaves the halfspaces vulnerable. Add in the lack of good pressing (common in the PL and at most Mourinho teams) and you start to understand why they are still miles ahead of winning the Champions League. But I’m no expert, it’s just my two cents. Also a shout out to TP, fantastic work mate, as always. The quality of this website’s articles is just astonishing. Thank you all for making us learn (and love even more ?) football ! Thanks a lot mate, we’ll try! I want to be coached. I want to learn. Please get an editor and be more concise with your writing. I have to read it two or three times to get the message your are trying to convey. I Love this types of posts on your blog! I Finally feel I can learn how to watch football in a propper way! Thank you for the hard work! Thank you for the kind words mate! Terrific piece of tactical theory that covers a very important topic with all of its various aspects very well. The term “compactness” is used so often these days, but I seriously doubt that many could explain it that detailed and meaningful. I´m very grateful for that. Everything is in there: General definitions, impact on different phases of the game and well-chosen examples. And, of course, it´s always great to use Cruyff quotes 😉 I´m looking forward to future articles like this one. Keep it up. You could make an article in itself purely of Cruyff quotes!